Next: Make Your Own Cashew Milk! Stop what you’re doing. This is not a drill. These cookies don’t contain ANY butter or hydrogenated oil. The secret ingredient?? Well, you’ve probably already guessed it– avocado! And these are not some ok-tasting-but-definitely-health-cookies– these are DELICIOUS, silky smooth, super-chocolaty, more than satisfying cookies. If I didn’t tell you they had avocado, you would have no idea. You would just think they are the most bold, intense, chocolate cookies you’ve ever been addicted to. + they’re dairy-free and whole wheat!! I haven’t tried them almond flour or another gluten-free flour yet…but I will, and will report back! Feel free to test it out and let me know how it goes! No mixer necessary– all you need is a spatula. Bonus if you also use a whisk. But really, however you want to mix it all together will work! 2) In a small bowl, sift together the flour, cocoa powder, and baking soda. Whisk together and set aside. 3) For the avocado, first you need to get to the flesh. Cut the avocado around length-wise and twist so you have two halves. Remove the seed. Using a large spoon, scoop the flesh of the avocado into a food processor and puree until completely smooth. 4) Measure out 1/2 cup of avocado and put into a large bowl. Add both sugars, the egg, and the vanilla extract. Whisk these ingredients together until fully combined. Then add in the flour mixture, folding it into the wet ingredients with a rubber spatula until just combined. Add in about 1/2 of the chocolate chips and stir. 5) Line a large baking sheet with a silpat mat. Using a small cookie scoop, scoop the dough onto the baking sheet, leaving a little space between each cookie. They will not spread much. 6) Gently press the remaining chocolate chips into the top of the cookie dough balls. Bake the cookies in the preheated oven for about 8 minutes or until they look set and not wet. And voila!! 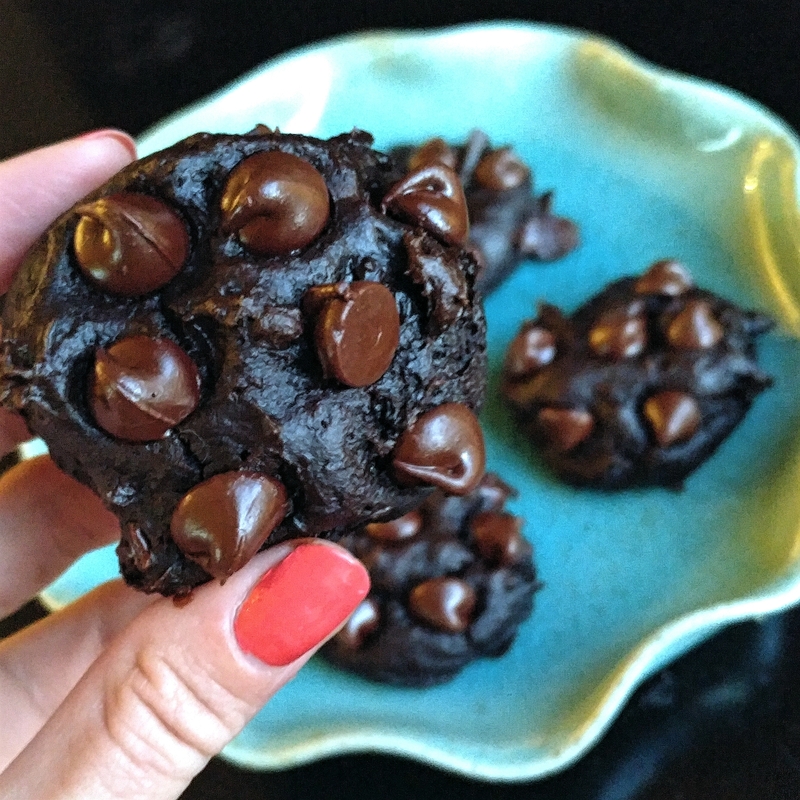 You’ll have about 15 gooey, chocolaty, health-fat cookies. Healthy? I mean, they’re not a superfood or anything. But if you’re going to have a cookie, these certainly have more nutritional value than the average treat! !